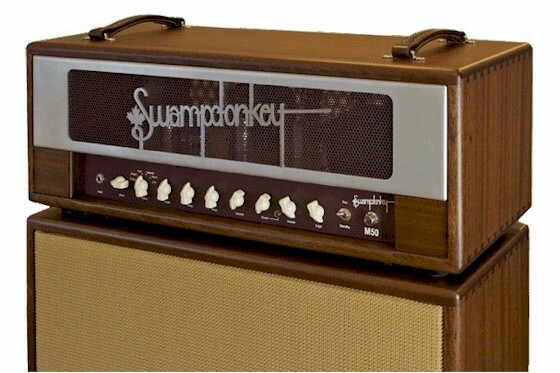 The Swampdonkey Punkster is the world's first guitar amp built around the fabulous TungSol KT120 power tube! Dishing over 100 watts, this two channel amp is designed for Punk, Rock and Metal players seeking the ultimate crunch! Here's a short demo of the Redpoll which delivers approximately 22 watts from a pair of 6V6 tubes and features a bypass-able panoramic EQ for a variety of gain and tone possibilities, a stunning tube and transformer driven Reverb and Tremolo. This may be the perfect combo to gig with. 35 watts from a pair of 7591 tubes with a fabulous reverb. There's plenty of clean headroom that winds up to a stout crunch. Our 50 watt, single channel head that also will accept 6V6 tubes for lower wattage or a variety of standard octal output tubes. Glistening cleans to overdriven crunch and great rock tones for lead and rhythm. 2 channels that can be cascaded easily with a patch cord for higher gain output. The Gypsy is a Single Ended output amp that uses a KT88 tube for about 30 watts of output. 15 watts Single Ended from an EL34. The Moosette will also accept a 6V6 tube for a lower output. Features include a stellar parallel reverb and a Jensen Alnico speaker - 12" or 10". Swampdonkey Amplifiers™ are lovingly crafted by hand in the Alberta Foothills using the highest quality components available. Our designs are all-tube with NO digital electronics and NO switching electronics in the critical signal path. Our amplifiers are all individually hand inspected by the Canadian Standards Association (CSA) and are approved under SPE-1000. Our design philosophy is to provide players with a versatile, reliable, well built product with a unique sound that will stand up to years and years of professional use. 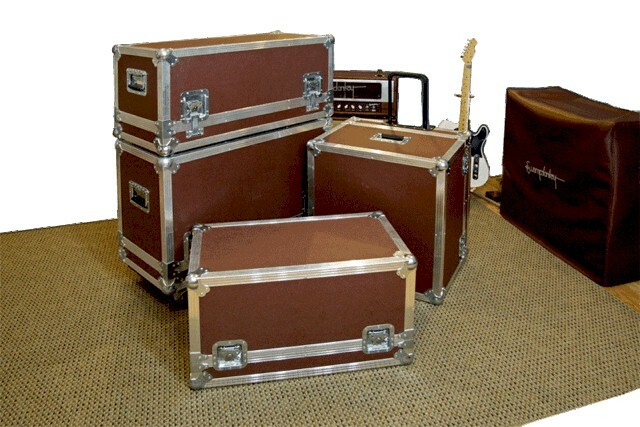 And to keep you looking and sounding good on the road, all our amplifiers & speaker cabinets come standard with a full ATA flight case. At Swampdonkey Amplifiers™, we realize that "tone" is an esoteric quality that enters the guitar through your fingers. Your gear either helps you get there, or it gets in your way. We think that every player who seeks their own amplifier tone needs to be able to control the signal path with as much flexibility and simplicity as the builder can provide without adding noise or other artifacts. That being said, the basic platform for an amplifier must be able to deliver it's own unique expression of amplification and tone generation. The inspiration, the player, the instrument and the amplifier are all essential and when properly combined are a force of nature. Our designs are originals, just like you are. We realize that many players are after something different. Something unique to call their tone. Our products are designed with a 100 year lifespan in mind and we offer a 3 year warranty on all chassis. Five Star Field Service is available in the Calgary area to resident and touring guitarists who require on-site service for tube amps, gear and guitar electronics. Please see our NEWS page for details ! We also offer repair and modification services for vintage & modern amplifiers and custom amplifier design upon request. Please contact us with your needs ! WANTED: Non-working / Basket case tube amps of all sorts for rebuilding & collecting. Cash paid ! The names "Swampdonkey Amplifiers™", "Gypsy™", "Moosette™" and "Five Star Field Service™" as well as our distinctive logo design are Trademarks of Moose Meadow Enterprises Ltd.